Above: The overlooked but critically important manhole is the subject of Mohammad Najafi's infrastructure research. Face it: This planet’s shifty topsoil skin just can’t be counted on to behave. Add a little rain and it expands. Throw in a few 100-degree days and it shrinks, opening gaping cracks. Then there’s erosion, earthquakes, chemical reactions, gravity, load stresses, and a plethora of other natural or man-made events that all contribute to soil—and, eventually, infrastructure—instability. Over time, this means highways buckle and crack. Pipelines stressed by soil movement break, sometimes leaking millions of gallons of water, or sewage, or oil, causing catastrophic environmental damage. Manholes collapse, contributing to urban flooding. And since soil-shifting issues vary dramatically from one region to another, there’s no magic bullet to fix the problem. “It’s very inconvenient, frequently dangerous, and always costly, with billions of dollars annually and trillions over time spent in building and repairing infrastructure,” says Anand Puppala, Distinguished Professor of Civil Engineering and director of UT Arlington’s Sustainable and Resilient Infrastructure Research Center (SARCI). 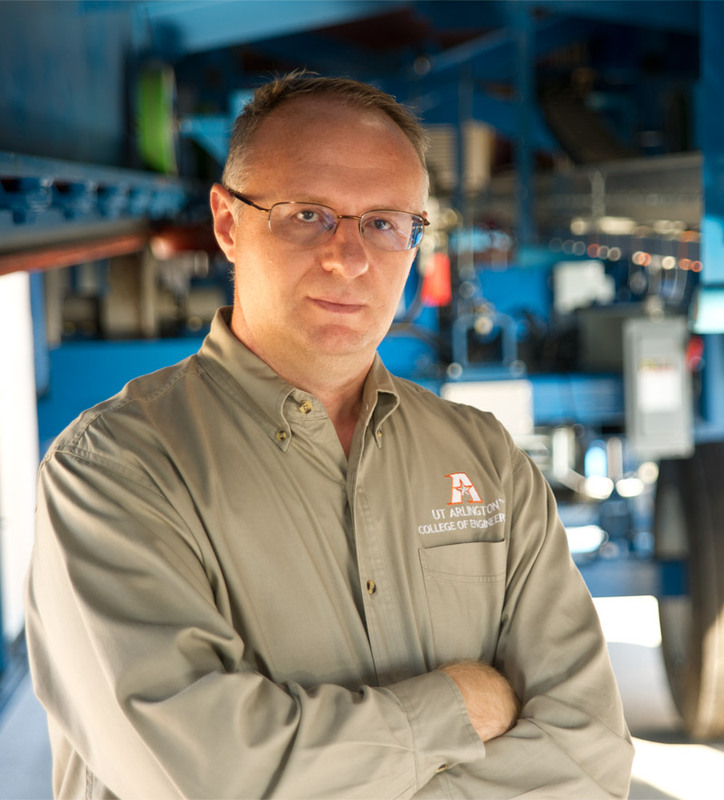 Dr. Puppala is one of many at UTA developing innovative ways to make essential infrastructure like highways, pipelines, and manholes more resistant to damage from our ever-changing planet. That old saying about the prairie eventually taking back its own isn’t just about prairies—it’s about the whole Earth. That old saying about the prairie eventually taking back its own isn’t just about prairies—it’s about the whole Earth. In some regions, however, the soil is trying to assert its dominance more aggressively than in others. Texas, for instance, has vast areas with sulfate-rich expansive soils left over from periods when shallow seas were present. That type of soil expands and contracts dramatically depending on how much moisture is present, playing havoc with streets, foundations, runways, and pipeline routes. Compounding the problem, Puppala says, is that some traditional soil-stabilization treatments involving lime and cement may have made things worse by actually increasing the soil’s expansiveness with water, creating a costly, pavement-destroying heave effect. As one of the world’s top authorities on the subject, he, along with his collaborators within SARCI, is developing efficient, inexpensive sensors and predictive software to measure not only how different soils will affect infrastructure like highways or pipelines over time, but also how effective various stabilizing procedures will be. The information is vitally important given the country’s continued population growth, as roads and bridges must bear more traffic, and pipelines—now built larger—must contain enormous pressures both internally and from the built environment around them. Maximizing the life span of infrastructure is both a practical and economic priority. Puppala and his SARCI colleagues are just one UT Arlington group addressing infrastructure issues. When it comes to such research, the University has become a major public resource, especially with the opening of the Accelerated Pavement Testing Center (APTC) last year, which is the only one of its kind in Texas. Located in Fort Worth near the UT Arlington Research Institute, the APTC uses a mobile pavement testing machine that can recreate the stresses caused by years of traffic and other conditions in just a few days. The Texas Department of Transportation (TxDOT) recently awarded a $1.12 million grant to civil engineering Professor Stefan Romanoschi, who manages the facility, to study the durability of recycled asphalt when used in road construction and to research techniques to improve its performance. To do so, he employs the center’s pavement testing machine, which he designed. The 68-foot-tall, 30-ton device is pulled over a strip of pavement, the equivalent of a short stretch of highway. What looks like heavy tires on a truck axle make an endless series of contacts with the road surface, wearing it out. Sensors in the test track help researchers interpret the effects of long-term and extensive axle load on the pavement. 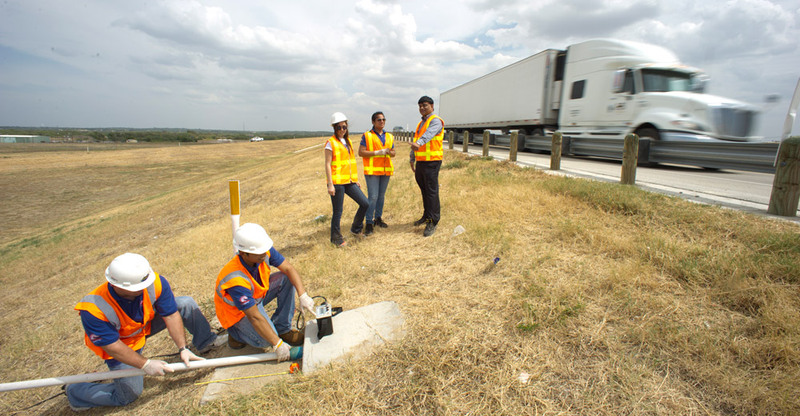 Anand Puppala, right, and his research assistants test sensors that measure how soil affects roadways over time. Minutes with the machine are equivalent to days of real-world traffic, making it easy to reproduce the type of pounding that trucks and cars inflict on an expressway over many years. The project’s findings could influence the construction of airport runways, parking areas, or any paved surface affected by load or soil conditions. While Romanoschi focuses on infrastructure most of us use every day, Assistant Professor Mohammad Najafi’s interest lies with something few pay attention to: manholes. The director of the Center for Underground Infrastructure Research and Education (CUIRE) is an authority on the lowly but essential road coverings, which number more than 20 million in the United States alone. These critical pieces of infrastructure are everywhere—on average, one exists every 400 feet. And many are getting old, often existing in severely deteriorating states that go unnoticed until they fail. At the Accelerated Pavement Testing Center, Stefan Romanoschi puts asphalt through the wringer. Yet according to the civil engineer, despite the staggering cost of building and maintaining manhole systems, there is little in the way of construction or maintenance guidelines. He recently received a grant from the Water Environment Research Foundation to find ways to rehabilitate manholes that don’t involve the highly expensive process of digging them out. He predicts the research will lead to techniques that can test manholes and provide insights on materials that will be both affordable and efficient in making repairs, such as spray-on composites or treated cement. The work of Najafi, Puppala, and Romanoschi is just the beginning of UT Arlington’s commitment to infrastructure research. Grants continue to roll in. The National Cooperative Highway Research Program recently awarded $500,000 to develop instruments that examine the compaction of soil and aggregate bases (do it wrong and rutting and cracking can result). A grant from TxDOT addresses pre-paving treatment of those troublesome sulfate soils in Texas. And the Tarrant Regional Water District is funding a study on ground treatment options for subsoils to better support giant water pipe delivery infrastructure, with an aim for both greater durability and sustainability. What these and future UT Arlington researchers discover will add significantly to our understanding of critical infrastructure issues and help guide construction and rehabilitation efforts across the country and around the world.